As 2018 draws to a close, it is time for my annual “Top 10” series. Here, I’ll look back on the 10 best airport lounges I visited in 2018. I appreciated that this Priority Pass lounge had very good lasagna and coffee…after driving all day it surely hit the spot before my EasyJet flight to Paris. This is my favorite Priority Pass lounge in Europe. What a step up this lounge is compared to the Admirals Club. I appreciated the wide selection of food, fast wi-fi, and comfortable seating. I was flying business class so was not able to try the Flagship First dining room, but that offers an even higher level of service. Don’t forget the Flagship Bridge! Okay, this is four lounges, but in order to add a bit more diversity to my list, I’m lumping all four Polaris lounges into one. I’ve listed them in order of preference above. While San Francisco is the most beautiful, I experienced better dining and service in Newark. But even last place Chicago is still a great lounge. LAX opens next month! My favorite of all lounges at LAX continues to impress. I was just there last week before my Air France flight and enjoyed a decadent meal. Plus, the coffee is always excellent. I finally had a chance to spend a few hours in the Virgin Clubhouse earlier this month and walked away very impressed. I enjoyed a good meal, complimentary massage, and appreciated the style of the lounge and welcoming staff. Stay tuned for a full review next month. I’ve been in this Lufthansa first class lounge more than any other Lufthansa lounge in 2018. It feels almost as private as the First Class Terminal and offers the same amenities and menu. A filet mignon with French Fries is always a treat before or after a flight. I found the new Munich lounge to be Lufthansa’s most beautiful. I love the natural light and beautiful patio. While the food is slightly better in Frankfurt, come hungry and leave satisfied. This is such a beautiful lounge. In fact, I’d rank this as the second most beautiful lounge in the world only to SWISS’s other first class lounge near the E-gates. That’s just my style preference, but even if minimalism is not your thing, the food and drink in this lounge are excellent. Near or at the top of my list every year, I cannot help but to continue to rave about Lufthansa’s First Class Terminal. The service is always wonderful, the food tasty, coffee excellent, and it never feels too crowded. What made this lounge #1 was not its beauty nor its overall amenities, but its menu. I’m not exaggerating when I state that this was one of my top meals of the year and absolutely the best lounge meal I have ever had. My list is certainly subjective, but you can see how much I appreciate food in an airline lounge. 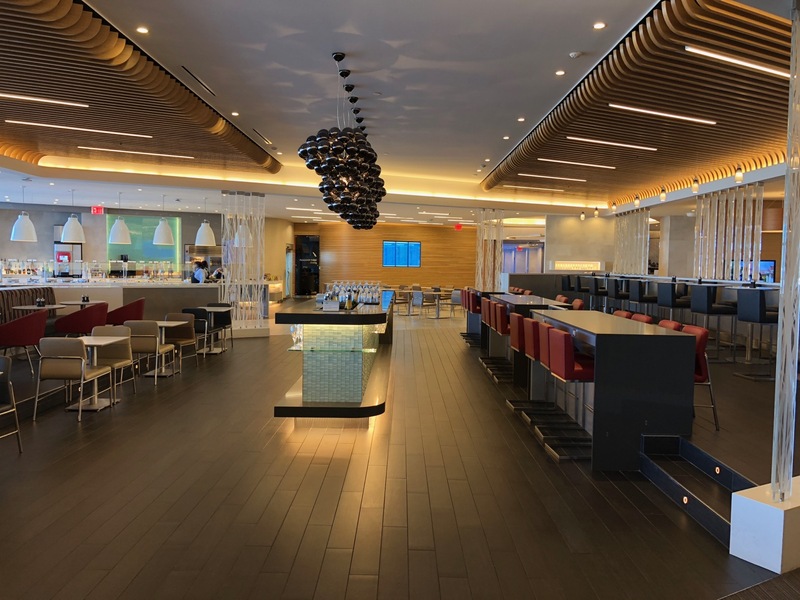 What was your favorite airline lounge in 2018? Coming next: my top 10 airline meals of 2018. You may not have visited it, but no love for The Pier in HKG? Currently posted up inside the CX F lounge at LHR. Small but very nice. Agreed. The Pier is likely my favorite lounge to visit of all the lounges I regularly visit. The restaurant inside is very good. Another CX lounge that doesn’t get much press is their business class lounge at MNL. It is easily the best lounge in Manila (regardless of terminal). Plenty of space, a nice bar and a short order cook that makes traditional Chinese cuisine. I go to Manila a few times during the year for work, and I look forward to this lounge every time. I have to chime in on Cathay Pacofic’s “The Pier” at HKG. Fantastic space, great food. The “baked eggs” were delicious. I had a 7 hour layover there in 2016 and never got bored with the place. I’m only reviewing lounges I have visited in 2018. I’m sure The Pier would be toward the top of the list had I visited it this year. I found the food at all of the Cathay HKG lounges god awful. I had 8 x 4h+ layovers in HKG last year and ended up getting good cantonese food at the retail restaurants halfway through. Nice lounges but not worth eating literally anything at. Maybe my difference of taste opinion is that I live most in Asia and am used to eating local food. I know you’re not a big drinker, but my complaint about the Air France lounge is that while they have a very beautiful selection of scotches on the display wall, many are actually not available when you try to order it. One lounge I would have on this list is Eithad First Lounge in AUH. They have one unique amenity that more transit lounges should have. There’s a decent sized gym with a private shower attached. When you’ve been sitting for 10+ hours and have more to go, this is a wonderful luxury. Beautiful lounge and certainly in my top-10 list, but I did not visit it this year. Where are the Hong Kong Cathay lounges? The Emirates First Class lounge? Singapore’s Private Room? Al Mourjan? Air Canada’s Signature Suite? Oh, that’s right: none of them have decent coffee. I do respect you for your consistency! It’s the top 10 that he physically visited in 2008, not the top 10 period. Though I think an overall Top 10 post regardless of visit date would be interesting. @Justin: If coffee was my main concern, the Air France La Premiere lounge would not have made the list. The only lounges on this list I visited were the La Premiere lounge and the Qantas lounge at LAX. I won’t quibble with the La Premiere lounge (though I’m surprised you gave them a pass for the machine made coffee), but as I reflect on it, I find the QF F lounge overrated. The space is lovely, but they hammered my minute steak, and service in the dining area was poor. P.S. If you’re going to be in the LAX Polaris lounge between 8 and 10 am on the preview day, hope we run into each other. Food at the Qantas First lounge is hit or miss. And chef execution is inconsistent. They seem to find employees they can pay as little as possible. Minute steak has always been a bad choice on the menu for the past 3 years I’ve been going there. Fish is good. Sandwiches are not worth ordering. Neither are many of the seasonal entrees. I had the fish (bass) last week and it was fabulous. Qantas F at LAX baffles me. Food and service are ponderous and every time I’m there it seems occupied mostly by families with screaming young kids. One World for me is less pretentious, quieter and more lively. It’s interesting, I’ve only been a few times and never found the Qantas lounge full or loud, but I have no trouble going to the OneWorld lounge. In fact, when the taco cart rolls in I prefer it! And the coffee in the oneworld lounge is just as good as in the Qantas lounge (and far better than the slop in the Star Alliance, Korean, Emirates, Etihad, and LAX Int’l lounges). I was in the AA Flagship lounge at JFK 2 days ago and wasn’t very impressed. It wasn’t bad, mind you, but the Flagship lounge at O’Hare is superior IMO. Nicer space, better food, and less crowded. I love this site, however this is ridiculous. Turkish Lounge in Istanbul – The best lounge in the world is not even featured on this list. Remember, we are only talking about lounges I have personally visited in 2018. I also love the Turkish lounge. Agree with Rob, the AA Flagship lounge at ORD is much better than JFK. Doesn’t sound like you visited them but 2 other favorites for me is the QD biz class lounge in DOH and the CX first class lounge at LHR.